Coldplay are a British alternative rock band formed in 1996 by lead vocalist Chris Martin and lead guitarist Jonny Buckland at University College London. After they formed Pectoralz, Guy Berryman joined the group as a bassist and they changed their name to Starfish. Will Champion joined as a drummer, backing vocalist, and multi-instrumentalist, completing the line-up. Manager Phil Harvey is often considered an unofficial fifth member. The band renamed themselves “Coldplay” in 1998, before recording and releasing three EPs; Safety in 1998, Brothers & Sisters as a single in 1999 and The Blue Room in the same year. The latter was their first release on a major label, after signing to Parlophone. They achieved worldwide fame with the release of the single “Yellow” in 2000, followed by their debut album released in the same year, Parachutes, which was nominated for the Mercury Prize. The band’s second album, A Rush of Blood to the Head (2002), was released to critical acclaim and won multiple awards, including NME‘s Album of the Year. Their next release, X&Y, the best-selling album worldwide in 2005, was met with mostly positive reviews upon its release, though some critics felt that it was inferior to its predecessor. The band’s fourth studio album, Viva la Vida or Death and All His Friends (2008), was produced byBrian Eno and released again to largely positive reviews, earning several Grammy nominations and wins at the 51st Grammy Awards. On 24 October 2011, they released their fifth studio album, Mylo Xyloto, which received mixed to positive reviews, topped the charts in over 34 countries, and was the UK’s best-selling rock album of 2011. The band has won a number of music awards throughout their career, including seven Brit Awards—winning Best British Group three times, five MTV Video Music Awards, and seven Grammy Awards from twenty five nominations. Coldplay have sold over 60 million records worldwide. In December 2009, Rolling Stonereaders voted the group the fourth-best artist of the 2000s. Coldplay have been an active supporter of various social and political causes, such as Oxfam‘s Make Trade Fair campaign and Amnesty International. The group have also performed at various charity projects such as Band Aid 20, Live 8, Sound Relief, Hope for Haiti Now: A Global Benefit for Earthquake Relief, The Secret Policeman’s Ball, and the Teenage Cancer Trust. Chris Martin and Jonny Buckland first met during their orientation week at University College London (UCL) in September 1996. The pair spent the rest of the university year planning a band, ultimately forming a group called Pectoralz. Guy Berryman, a classmate of Martin and Buckland, later joined the group. By 1997, the group, who had renamed themselves Starfish, performed gigs for local Camden promoters at small clubs. Martin also had recruited his longtime school friend Phil Harvey, who was studying classics at the University of Oxford, to be the band’s manager. Coldplay have since accepted Harvey as the fifth member of the group. The band’s line-up was completed when Will Champion joined to take up percussion duties. Champion had grown up playing piano, guitar, bass, and tin whistle; he quickly learned the drums (despite having no previous experience). The band finally settled on the name “Coldplay” which was suggested by Tim Crompton, a local student who had been using the name for his group. By 1997, Martin had also met then Classics student Tim Rice-Oxley. During a weekend on Virginia Water, they asked each other to play off their own songs on the piano. Martin, finding Rice-Oxley to be talented, asked him to be Coldplay’s keyboard player but Rice-Oxley refused as his own band, Keane, was already active. Days after, this event would shape the second line-up of Keane and keep Coldplay’s unaltered, thus leaving both bands as quartets. In 1998, the band released 500 copies of the Safety EP. Most of the discs were given to record companies and friends; only 50 copies remained for sale to the public. In December of that year, Coldplay signed to the independent label Fierce Panda. Their first release was the three-track Brothers and Sisters EP, which they had quickly recorded over four days in February 1999. After completing their final examinations, Coldplay signed to Parlophone for a five-album contract in early 1999. After making their first appearance at Glastonbury, the band went into studio to record a third EP titled The Blue Room. Five thousand copies were made available to the public in October, and the single “Bigger Stronger”, received BBC Radio 1 airplay. The recording sessions for The Blue Roomwere tumultuous. Champion was briefly fired from the band, but Martin later pleaded with him to return after kicking him out, and because of his guilt, went on a drinking binge. Eventually, the band worked out their differences and put in place a new set of rules to keep the group intact. Inspired by bands like U2 and R.E.M., Coldplay decided that they would operate as a democracy (and that profits would be shared with Guy, Will, and Jonny receiving 20% each and Chris receiving 40%). Additionally, the band determined they would fire anyone who used hard drugs. The band initially planned to record their debut album in the space of two weeks. 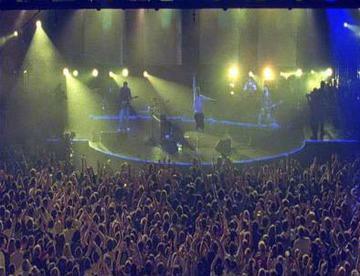 However, tours and other live performances caused the recording to spread out between September 1999 and April–May 2000. The album was recorded at Rockfield Studios, Matrix Studios, and Wessex Sound Studioswith producer Ken Nelson, although the majority of Parachutes’ tracks were recorded at Liverpool‘s Parr Street Studios (where they accessed three studio rooms). The mixing process on all songs for the album was done by American engineer Michael Brauer in New York. During that period, they played on the Carling Tour, which showcased up-and-coming acts. 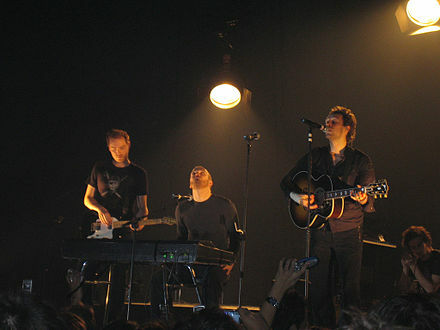 After releasing three EPs without a hit song, Coldplay sparked their first Top 40 hit with the lead single from Parachutes, “Shiver“, released in March 2000 to a number 35 peak position on the UK Singles Chart. June 2000 was a pivotal moment in Coldplay’s history: the band embarked on their first headlining tour, including a showing at the Glastonbury Festival. The band also released the breakthrough single “Yellow“. Having the role as Coldplay’s first release to crack the top five, the song shot to number four on the UK Singles Chart and placed Coldplay in public consciousness. “Yellow” and “Shiver” were initially released as EPs in the spring of 2000. The former was later released as a single in United Kingdom on 26 June 2000. In the United States, the song was released as the lead single from the then-untitled debut album. In October 2000, the track was sent to US college and alternative radio outlets. Coldplay released their first studio album, Parachutes, on 10 July 2000 in the United Kingdom via their record label, Parlophone. The album debuted at number one on the UK Albums Chart. It was released on 7 November 2000 by record label Nettwerk in North America. The album has been made available on various formats since its initial release; both Parlophone and Nettwerk released it as a CD in 2000, and it was also released as a cassette by new US label Capitol in 2001. In the following year, Parlophone issued the album as an LP. The band released a limited-edition CD of “Trouble“, the third single from the album, which features a remix of “Yellow”. It was pressed to 1,000 copies, and was issued only to fans and journalists. Both “Yellow” and “Trouble” earned regular radio airplay in the UK and US. The band wrote more than 20 songs for the album. Some of their new material, including “In My Place” and “Animals”, was played live while the band was still touringParachutes. The album’s title was revealed through a post on the band’s official website. The album was released in August 2002 and spawned several popular singles, including “In My Place”, “Clocks“, and the ballad “The Scientist“. The latter was inspired by George Harrison‘s title track to All Things Must Pass, which was released in 1970. Coldplay toured from June 2002 to September 2003 for the A Rush of Blood to the Head Tour. They visited five continents, including co-headlining festival dates atGlastonbury Festival, V2003 and Rock Werchter. Many concerts showcased elaborate lighting and individualised screens reminiscent of U2’s Elevation Tour andNine Inch Nails‘ Fragility Tour. During the extended tour, Coldplay recorded a live DVD and CD, Live 2003, at Sydney’s Hordern Pavilion. At the 2003 Brit Awards held at Earls Court, London, Coldplay received awards for Best British Group, and Best British Album. On 28 August 2003, Coldplay performed “The Scientist” at the 2003 MTV Video Music Awards at the Radio City Music Hall in New York City, and won three awards. In December 2003, readers of Rolling Stone chose Coldplay as the best artist and the best band of the year. At that time the band covered The Pretenders‘ 1983 song “2000 Miles” (which was made available for download on their official website). “2000 Miles” was the top selling UK download that year, with proceeds from the sales donated to Future Forests and Stop Handgun Violence campaigns. A Rush of Blood to the Head won the Grammy Award for Best Alternative Music Album at the 2003 Grammy Awards. At the 2004 Grammy Awards, Coldplay earned Record of the Year for “Clocks”. 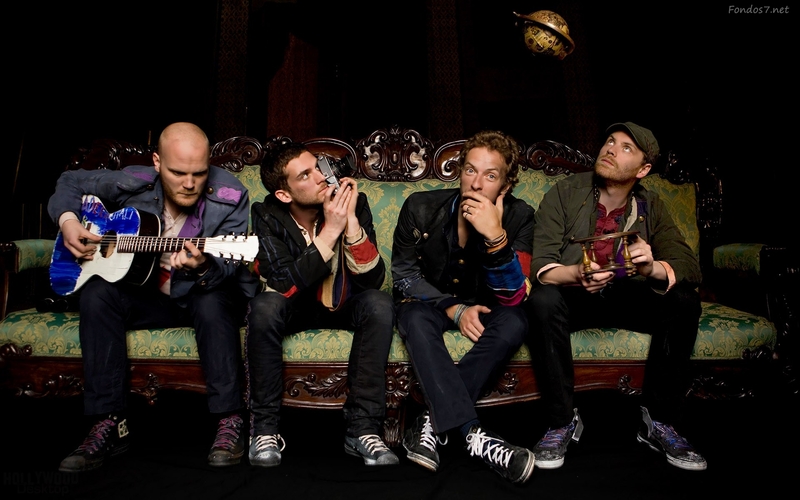 Coldplay spent most of 2004 out of the spotlight, taking a break from touring and releasing a satire music video of a song from a fictional band titled The Nappies while recording their third album. X&Y was released in June 2005 in UK and Europe. This new, delayed release date had put the album back into the next fiscal year, actually causing EMI’s stock to drop. It became the best-selling album of 2005 with worldwide sales of 8.3 million. The lead single, “Speed of Sound“,made its radio and online music store debut on 18 April and was released as a CD on 23 May 2005. X&Y entered the album charts of 20 countries at the number one position and was the third-fastest selling album in UK chart history. Two other singles were released that year: “Fix You” in September and “Talk” in December. Critical reaction to X&Y was mostly positive, though slightly less enthusiastic than that of its predecessor. New York Times critic Jon Pareles describing Coldplay as “the most insufferable band of the decade”, whereas NME awarded the album 9/10 calling it “Confident, bold, ambitious, bunged with singles and impossible to contain, ‘X&Y’ doesn’t reinvent the wheel but it does reinforce Coldplay as the band of their time”. Comparisons between Coldplay and U2 became increasingly common. Chris Martin later revealed that the reviews that ranged from mixed to negative, note-worthy for their remarks on comparing them to U2, made him feel “liberated”. 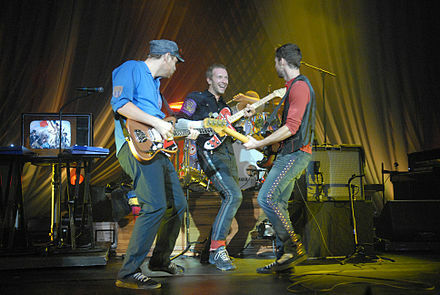 From June 2005 to July 2006, Coldplay went on their Twisted Logic Tour, which included festival dates like Coachella, Isle of Wight Festival, Glastonbury and theAustin City Limits Music Festival. In July 2005, the band appeared at Live 8 in Hyde Park, where they played a rendition of The Verve‘s “Bitter Sweet Symphony” with Richard Ashcroft on vocals. 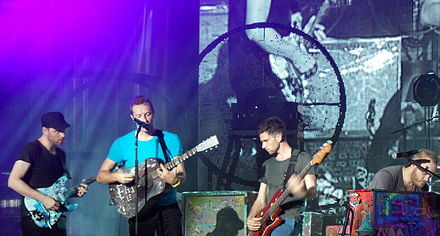 On 28 August, Coldplay performed “Speed of Sound” at the 2005 MTV Video Music Awards in Miami. In September, Coldplay recorded a new version of “How You See the World” with reworked lyrics for War Child‘s Help! : A Day in the Life charity album. In February 2006, Coldplay earned Best Album and Best Single honours at the Brit Awards. Two more singles were released during 2006, “The Hardest Part” and “What If“. The sixth and final single, “White Shadows” was released in Mexico during June 2007. In October 2006, Coldplay began work on their fourth studio album, Viva la Vida or Death and All His Friends, with producer Brian Eno. Taking a break from recording, the band toured Latin America in early 2007, performing in Chile, Argentina, Brazil, and Mexico. After recording in churches and other venues in Latin America and Spain during their tour, the band said the album would likely reflect Hispanic influence. The group spent the rest of the year recording with Eno. Martin described Viva la Vida as a new direction for Coldplay: a change from their past three albums, which they have referred to as a “trilogy”. He said the album featured less falsetto as he allowed his voice’s lower register to take precedence. Some songs, such as “Violet Hill“, contain distorted guitarriffs and bluesy undertones. “Violet Hill” was confirmed as the first single, with a radio release date of 29 April 2008. After the first play, it was freely obtainable from Coldplay’s website from 12:15 pm (GMT +0) for one week (achieving two million downloads), until it became commercially available to download on 6 May. “Violet Hill” entered the UK Top 10, US Top 40 (entering the Top 10 in the Hot Modern Rock Tracks chart) and charted well in the rest of the world. The title track, “Viva la Vida“, was also released exclusively on iTunes. It became the band’s first number one on the Billboard Hot 100, and their first UK number one, based on download sales alone.This was also the first Number One in the UK Singles Chart to be based solely on download sales. Upon release, Viva la Vida or Death and All His Friends topped the album charts worldwide, and was the world’s best-selling album of 2008. It hit number one on the UK album chart, despite having come on the market only three days previously. In that time, it sold 302,000 copies; the BBC called it “one of the fastest-selling records in UK history”. By the end of June, it had set a new record for most-downloaded album ever. In October 2008, Coldplay won two Q Awards for Best Album for Viva la Vida or Death and All His Friends and Best Act in the World Today. On 9 November, Coldplay were named the World’s Best Selling Act of 2008 at the World Music Awards in Monte Carlo. They also picked up two other awards, World’s Best Selling Rock Act and Great Britain’s Best Selling Act. The band followed up Viva la Vida or Death and All His Friends with the Prospekt’s MarchEP, which was released on 21 November 2008. The EP features tracks from the Viva la Vida or Death and All His Friends sessions and, as well as being available on its own, was issued as a bonus disc with later editions of Viva la Vida or Death and All His Friends. “Life in Technicolor II” was the only single released from the EP. 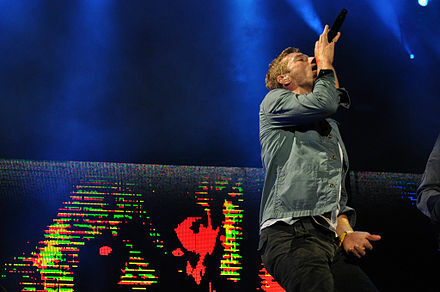 Coldplay began their Viva la Vida Tour in June, with a free concert at Brixton Academy in London. This was followed two days later by a 45-minute performance that was broadcast live from outside BBC Television Centre. Released in late 2008, “Lost!” became the third single from the album, featuring a new version with Jay-Z. After performing the opening set on 14 March 2009 for Sound Relief at the Sydney Cricket Ground, Coldplay headlined a sold-out concert later that same night.Sound Relief is a benefit concert for victims of the Victorian Bushfire Crisis and the Queensland Floods. On 4 December 2008, Joe Satriani filed a copyright infringement suit against Coldplay in the United States District Court for the Central District of California. Satriani’s suit asserted that the Coldplay song “Viva la Vida” includes “substantial original portions” of the Satriani song “If I Could Fly” from his 2004 album, Is There Love in Space?. The Coldplay song in question received two Grammy Awards for “Song of the Year.” The band denied the allegation. An unspecified settlement was ultimately reached between the parties. Coldplay were nominated for four BRIT Awards in 2009: British Group, British Live Act, British Single (“Viva la Vida”) and British Album (Viva la Vida or Death and All His Friends). At the 51st Grammy Awards in the same year, Coldplay won three Grammy Awards in the categories for Song of Year for “Viva la Vida”, Best Rock Album for Viva la Vida or Death and All His Friends, and Best Vocal Pop Performance by a Duo or Group for “Viva la Vida”. A live album entitled LeftRightLeftRightLeft was recorded at various shows during the tour. LeftRightLeftRightLeft, released on 15 May 2009, was to be given away at the remaining concerts of their Viva la Vidatour. It was also released as a free download from their website. Following the Viva la Vida Tour, Coldplay announced another “Latin America Tour” to take place in February and March 2010, in which they were to visit Mexico, Argentina, Brazil, and Colombia. In October 2009, Coldplay won Song of the Year for “Viva la Vida” at The American Society of Composers, Authors and Publishers (ASCAP) Awards in London. In December 2009, Rolling Stone readers voted the group the fourth best artist of the 2000s. The band finished recording the new album in mid-2011. When Martin and Champion were interviewed by BBC Radio and asked about the album’s lyrical themes, Martin replied “It’s about love, addiction, OCD, escape and working for someone you don’t like.” When asked whether or not their fifth album would be out by the summer, Martin and Champion said that there was plenty of work to be done before releasing it. They confirmed several festival appearances before its release date, especially a headlining spot in the 2011 Rock Werchter, Pinkpop Festival, Glastonbury Festival, T in the Park, Austin City Limits Music Festival, Rock in Rio, andLollapalooza festivals. In an interview on 13 January 2011, Coldplay mentioned two new songs to be included on their upcoming fifth album, “Princess of China” and “Every Teardrop Is a Waterfall“. In a February interview, Parlophone president Miles Leonard told HitQuarters that the band were still in the studio working on the album and he expected the final version would appear “towards the autumn of this year”. On 31 May 2011, Coldplay announced that “Every Teardrop Is a Waterfall” was to be the first single for the fifth album. It was released on 3 June 2011. The band also presented five new songs at festivals during the summer of 2011, “Charlie Brown“, “Hurts Like Heaven“, “Us Against the World”, “Princess of China” and “Major Minus“. On 12 August 2011, Coldplay announced via their official website that Mylo Xyloto is the new album title, and that it would be released on 24 October 2011. On 12 September the band released the second single from their upcoming album Mylo Xyloto entitled “Paradise“. On 23 September 2011, tickets for Coldplay’s European tour officially went on sale. Demand proved to be very high with most venues selling out in seconds. Mylo Xyloto was released on 24 October 2011, to mixed to positive reviews, and topped the charts in over 34 countries. On 19 October 2011, Coldplay performed songs at Apple Inc.‘s private memorial event for Steve Jobs, including “Viva la Vida”, “Fix You”, “Yellow” and “Every Teardrop Is a Waterfall”. On 26 October their “Amex Unstaged” concert at the Plaza de Toros de Las Ventas in Madrid, Spain, was streamed by YouTube as a livewebcast directed by Anton Corbijn. On 30 November 2011, Coldplay received three Grammy Award nominations for the 54th Grammy Awards which took place on 12 February 2012 in Los Angeles, and the band performed with Rihanna at the ceremony. On 12 January 2012, Coldplay were nominated for two Brit Awards. On 21 February 2012, they were awarded the Brit Award for Best British Group for the third time. The album was the best-selling rock album in the United Kingdom, selling 908,000 copies. The album’s second single, “Paradise“, was also the best-selling rock single in the UK, selling 410,000 copies. At the2012 MTV Video Music Awards on 6 September, “Paradise” won the award for Best Rock Video. Mylo Xyloto has sold over 8 million copies worldwide. Coldplay headlined the closing ceremony of the London 2012 Paralympic games on 9 September 2012, where they performed alongside other artists including Rihanna and Jay-Z. To tie in with their performance at the closing ceremony, the group gave permission for bands who were participating in the Bandstand Marathon the opportunity to perform their 2008 single “Viva La Vida” to celebrate the end of the games. In October 2012, the music video for Coldplay’s song “Hurts Like Heaven” was released. The video was based on the story of Mylo Xyloto, a boy who grew up in tyranny ran by Major Minus. The fictional comics entitled Mylo Xyloto will continue on the story portrayed in the music video when the series is released in early 2013. A concert documentary film titled, “Coldplay Live 2012,” chronicles their tour in support of the Mylo Xyloto album. The film premiered theatrically for one night only, 13 November 2012, and was released on CD and home video on 19 November 2012. On 21 November, after a concert in Brisbane, Australia as part on the group’s Mylo Xyloto Tour, Coldplay hinted they are set to take a three-year break from touring. Coldplay performed two shows with Jay-Z in the Barclays Center, Brooklyn, New York, on 30 December and New Year’s Eve, and are set for a number of concerts in Latin America in February 2013. The Mylo Xyloto Tour was named the fourth-highest-grossing tour worldwide of 2012 with more than $171.3 million earned in ticket sales. Speaking to Australian radio station 2dayfm, Chris Martin revealed that the title for their next album: “is much easier to pronounce.” It was revealed in an interview that Coldplay are already working on what will be their 6th studio album. Coldplay’s frontman Chris Martin once proclaimed the band’s music as “limestone rock” in comparison to “hard rock”. The band’s music has been called “meditative” and “blue romantic”; it “[reflects] on their emotions” and Martin “endlessly examine[s] his feelings”. Martin’s lyrical wordplay has been called feminist, similar to Andrew Montgomery of Geneva. The tone of the band’s first studio album, Parachutes, was described as melodic pop with “distorted guitar riffs and swishing percussion” but also being “exquisitely dark and artistically abrasive”. Such alternative rock style has been compared to bands like U2, Oasis, Radiohead and Travis.The band acknowledges the Scottish alternative rock band, Travis, as a major influence on their earlier material. In their second studio album A Rush of Blood to the Head, the band draws inspiration from artists like Echo & the Bunnymen, Kate Bush, George Harrison and Muse. The songs in it were considered to contain “lush melodies and a heartbreak” and that they had a “newfound confidence.”The music on their third release X&Y has been considered to be “ruminations on Martin’s doubts, fears, hopes, and loves.” It was particularly influenced by the artists Johnny Cash and Kraftwerk. In Viva la Vida or Death And All His Friends, the group’s style was moving towards art rock, being influenced by the bands Blur, Arcade Fire and My Bloody Valentine. The band experimented with different instruments including orchestras, honky-tonk pianos and further so. Regarding their international wide success, the band’s president at Parlophone, Miles Leonard has stated that one of their “secrets” is that they have never sounded like a parochial UK artist, saying: “Some bands are very proud to be British, but sometimes come across as being very ‘British’. Coldplay never aspire to that; on one hand they sound British but on the other they sound like a huge global artist.” In 2011 Coldplay were hailed as ‘Rock Statesmen’. Despite their worldwide popularity, the band has remained protective of how their music is used in the media, refusing its use for product endorsements. In the past, Coldplay turned down multi-million dollar contracts from Gatorade, Diet Coke, and Gap, who wanted to use the songs “Yellow“, “Trouble“, and “Don’t Panic” respectively. According to frontman, Chris Martin, “We wouldn’t be able to live with ourselves if we sold the songs’ meanings like that.” The song “Viva la Vida” was featured in a commercial for the iTunes Store, advertising its exclusive availability of the single as a digital download on iTunes. Additionally, Chris Martin appeared at an Apple Inc. Special Event on 1 September 2010, playing a number of songs, and also thanked Apple for their assistance in marketing “Viva la Vida”. After the death of Steve Jobs, Coldplay performed four songs at Apple’s Campus in Cupertino, further thanking Jobs for the support he gave them. Coldplay supports Amnesty International and performed for them at The Secret Policeman’s Ball fundraiser in 2012. Martin is regarded as one of the most visible celebrity advocates for fair trade, supporting Oxfam‘s ongoing Make Trade Fair campaign. He has been on trips with Oxfam to assess conditions, has appeared in its advertising campaign, and is known for wearing a “Make Trade Fair” wristband during public appearances (including at Coldplay concerts). The band were also filmed for Make Poverty History, clicking their fingers. During the early years, Coldplay became widely known in the media for giving 10 percent of the band’s profits to charity, which they continue to do. Bassist Guy Berryman said, “You can make people aware of issues. It isn’t very much effort for us at all, but if it can help people, then we want to do it.” The band also asks that any gifts intended for them are donated to charity, according to a response on the FAQ section of Coldplay’s website. Martin spoke out against the 2003 invasion of Iraq by the US, UK and other forces, and endorsed the US Democratic presidential candidates John Kerry and Barack Obama in 2004 and 2008 respectively. In June 2009, Coldplay began supporting Meat Free Monday, a food campaign started by Paul McCartney which attempts to help slow climate change by having at least one meat free day a week. From 17 and 31 December 2009, Coldplay auctioned a quantity of significant band memorabilia, including their first guitars. Proceeds went to Kids Company, a charity which helps vulnerable children and young people in London. A month later in January 2010, Coldplay performed a slightly modified version of “A Message”, entitled “A Message 2010”, at the Hope For Haiti Now telethon special, raising money for the victims of the 2010 Haiti earthquake.